This report was created for global strategic planners who cannot be content with traditional methods of segmenting world markets. With the advent of a ?borderless world?, cities become a more important criteria in prioritizing markets, as opposed to regions, continents, or countries. This report covers the top 2000 cities in over 200 countries. It does so by reporting the estimated market size (in terms of latent demand) for each major city of the world. It then ranks these cities and reports them in terms of their size as a percent of the country where they are located, their geographic region (e.g. Africa, Asia, Europe, Middle East, North America, Latin America), and the total world market. In performing various economic analyses for its clients, I have been occasionally asked to investigate the market potential for various products and services across cities. The purpose of the studies is to understand the density of demand within a country and the extent to which a city might be used as a point of distribution within its region. From an economic perspective, however, a city does not represent a population within rigid geographical boundaries. To an economist or strategic planner, a city represents an area of dominant influence over markets in adjacent areas. This influence varies from one industry to another, but also from one period of time to another. 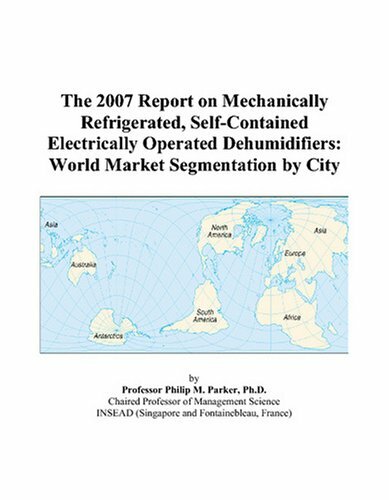 In what follows, I summarize the economic potential for the world\'s major cities for "mechanically refrigerated, self-contained electrically operated dehumidifiers" for the year 2007. The goal of this report is to report my findings on the real economic potential, or what an economist calls the latent demand, represented by a city when defined as an area of dominant influence. The reader needs to realize that latent demand may or may not represent real sales. For many items, latent demand is clearly observable in sales, as in the case for food or housing items. Consider, however, the category "satellite launch vehicles". Clearly, there are no launch pads in most cities of the world. However, the core benefit of the vehicles (e.g. telecommunications, etc.) is "consumed" by residents or industries within the world\'s cities. Without certain cities, in other words, the market for satellite launch vehicles would be lower for the world in general. One needs to allocate, therefore, a portion of the worldwide economic demand for launch vehicles to both regions and cities. This report takes the broader definition and considers, therefore, a city as a part of the global market.